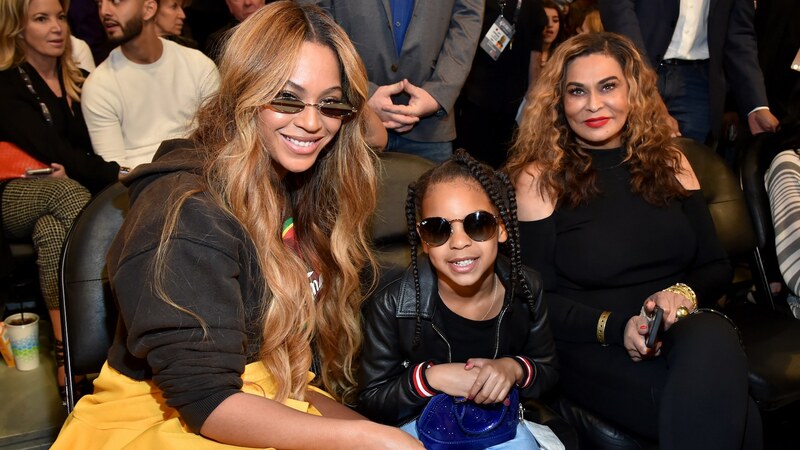 Talk about a slam dunk: Three generations of fabulous Knowles women were photographed courtside at the NBA All-Star Game this weekend. This is not your usual “we took Grandma to Target” weekend outing, that’s for sure. Dressed to the nines, Beyoncé, her daughter Blue Ivy, and Blue’s grandma Tina Knowles (with husband Richard Lawson) all took in the big game — between Team LeBron James and Team Stephen Curry — at the Staples Center in Los Angeles on Feb. 18. Lady Bey and Blue Ivy both rocked awesome shades and killer outfits. On hand was Beyoncé’s adorable Karl Lagerfeld white kitty bag, where she stashes Blue Ivy’s treats (hey, even the kids of music icons get hangry sometimes). Grandma Tina also held onto Blue Ivy’s juice box (awwwww). Seriously, can we talk about these mother-daughter outfits for a second (and also the hilarious straight-faced kid photobomber behind Blue Ivy)? Blue had on very cool distressed jeans and a rock star-chic black leather jacket, which made us weep for our own Garanimals-clad childhoods. And no battered Star Wars metal lunch box here; Blue Ivy toted a cobalt blue Louis Vuitton bag (retail: $1,820). Beyoncé went with a bright flared skirt in marigold with a cozy chocolate hoodie and clear laced heels. Like you do at a basketball game with your mom. 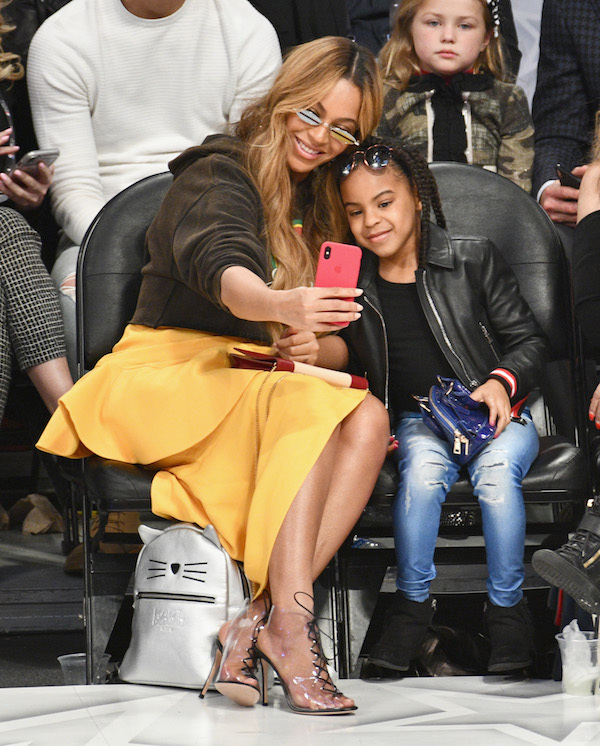 Bey and Blue had a blast at the game, snapping some selfies and scoping out the other stars present: Queen Latifah, Jamie Foxx, Kevin Hart, Jimmy Kimmel, DJ Khaled, Snoop Dogg, Chris Rock and Dave Chappelle. Blue Ivy even hitched a ride with a few cute mascots. Weird seeing #Beyonce front row chilling at the #NBAAllStar without #JayZ, but we love how they made this a family occasion for #BlueIvy Check out this clip and tell us if you know a luckier 6 year old. In absentia: Jay-Z. Hey, somebody’s got to stay home with the twins, Sir and Rumi. And this time around, Blue Ivy refrained from shushing her mama, as she did — most famously — at this year’s Grammys, seen here in the GIF tweeted around the globe. It’s not too shabby being Blue Ivy, that’s for sure. We’re pretty sure we know who really runs the world now.